Surviving holidays on a diet can be challenging. Halloween, Easter, Christmas and Thanksgiving all represent a feasting circle nightmare where families, friends and acquaintances we only partially know meet to share food and tall tales. If you are on a diet that can be a very tricky time but dieting successfully during the holidays is not impossible. It may sound a bit odd but why not take a person with you to these get-togethers? This can be a husband, wife, girlfriend, boyfriend or close friend. They can keep an eye out for you and let you know when you are about to step over your dietary line in to dangerous territory. This works even better if the person is dieting with you - you can be each other's voice on the shoulder. You become accountable to each other. Hold yourself accountable for what you eat by bringing your own plate and utensils. It sounds silly but smaller plates make what you choose look like more than what it really is and the same applies when utilizing smaller than average silverware. If the food looks bigger, you mentally trick yourself into feeling fuller. With so many parties raging during the holidays, you cannot possibly make it to every single one. Take the pressure off yourself (and your belt) by hosting your own party. This way you can maintain your diet on your own terms. Plan to include foods you can eat by reinventing old favorites so that you can eat them. Your friends and family may not even know the difference. 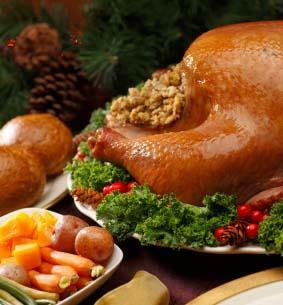 Surviving the holiday feasting schedule is more than possible with a little dedication, will power and planning ahead.